The painting, The Naked Maja is known as the first pornographic picture ever. The horrified Church authorities demanded the artist, Francisco Goya, paint clothing on her or they would destroy the canvas. Worse, the model was suspected to be the13th Duchess of Alba, and she was looking straight at the painter – no embarrassment here! Even when he was a little boy, Goya wanted to be a painter. After studying painting, at 14, he was apprenticed to a court painter. This should have been an excellent opportunity for young Goya, but the court painter did not like young Goya’s use of bold strokes and even bolder color. Goya then applied to the Royal Academy of Fine Arts in 1763, when he was 27. Rejected. He applied again in 1766. Rejected. 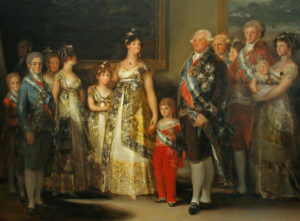 Goya eventually became court painter to Charles IV. His portraits of the royal family were not flattering, but he kept his position. He is called the line between the Old Masters and Modern Art. In 1792, Goya had a fever so high they feared for his life. He survived, but it left him permanently deaf. Already difficult, Goya became a recluse. After the death of his wife in 1812, Goya’s work became even more unsettling. He made a series of 82 prints between 1810 and 1820 which he titled The Disasters of War. They were so disturbing they were not shown until 35 years after his death. What made him go mad? He may have been slowly poisoned by the lead in his white paint. And The Naked Maja? Goya gave in to the Church. Soon, the Maja, in the exact reclining position, appeared in a not so demur white gown. What the authorities did not know was that this was an entirely new painting. Goya still had his Naked Maja. 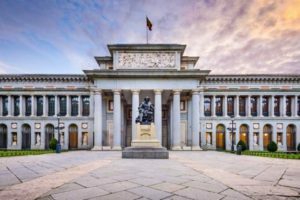 Today, both paintings can be seen side by side in the Museo del Prado in Madrid.